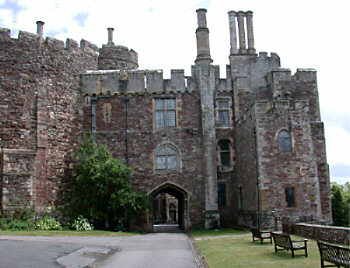 Having focused our last post on the reputed haunting of Berkeley Castle by the ghost of King Edward II, this next post takes a different tack and features the fine architecture that greets your eye as you approach the castle. The castle walls are suprisingly intact and look strong and menacing. It's hard to imagine how anyone would have dared to think of attacking it successfully. When you first approach the castle, it does not seem that big but when you venture down into the gardens and grounds, the castle walls seem to go on and on. It is a stunning piece of architecture and design, quite unique in shape and with a courtyard reminiscent of Alnwick Castle. You can read more about castle architecture on our dedicated web page.